Today is the day that all the students in year 11 at my school, and I believe a majority across the school, sat their final GCSE paper. It was a physics paper. Today also happens to be Eid al-fitr. Eid is a holy day in the Islamic faith and marks the end of the holy month of Ramadan. Eid al-Fitr is an important day in the Islamic faith. Muslims start it out by attending the mosque for prayers, before sitting down to share a meal with their families, which will be the first time they have done this during daylight in a month. I teach in a school where, I believe, around 30% of the student body practice Islam. This year has been particularly hard for year 11, as many have been observing the fast of Ramadan during their exam period and have had to miss important parts of their Eid rituals and celebrations in order to sit their final exams. Eid al-Fitr, and Eid al-adha – the most important Islamic holiday, follow the Islamic calendar and as such move year on year. Next year, Eid al-Fitr falls on June the 4th, the same day as one of the English Language GCSE exams, which ALL y11 students will sit, along with Business and music exams. This date will also feature A Level papers for English Language, English Lang and lit, art, RS and Chemistry. Personally, I would advocate for all holidays of all the major religions to be made bank holidays as the UK becomes an increasingly wonderful multi-cultural and diverse place, but I understand we are a long way from that dream becoming a reality. However, I am certain that a more achievable goal is becoming a society that manages to schedule GCSE and A-Level exams around such an important event. Many students this year have been disadvantaged this year because they have had an exam on a day that is massively important to them, their families and their religion. GCSE exams that fell today cover science, taken by the vast majority of students, and Citizenship, an exam I would argue was extremely important. A level exams that fell today were PE, Economics, English literature, Mathematics, Further Mathematics and Chinese. In the 2011 census Islam was the second biggest religion in the UK behind Christianity, and also the fasted growing religion. There are many local authority areas in the UK where more than 25% of the population follow the Islamic faith. These included Bradford, which is where I work, Blackburn, Luton and Birmingham. Some areas are over thirty, which includes Tower Hamlets, which has around 35% of its population following Islam. GCSE and A Levels are important examinations; they massively affect the future of those that sit them. The stresses on students at this time is massively high and I feel that it is hideously unfair to make this more difficult on one subset of students purely based on their religion. To have a few fallow days during the exam period would mean what? Lengthening the session by a few days?! Surely it’s time we stopped punishing students for what they believe in. It’s a question my year tens struggled with, and I think it is a clear marker to show the difference between the current specification foundation teir and the new spec. The current spec tends to test knowledge of isosceles triangles by giving a diagram showing one, giving an angle and asking students to calculate a missing angle. This question requires a bit of thinking. 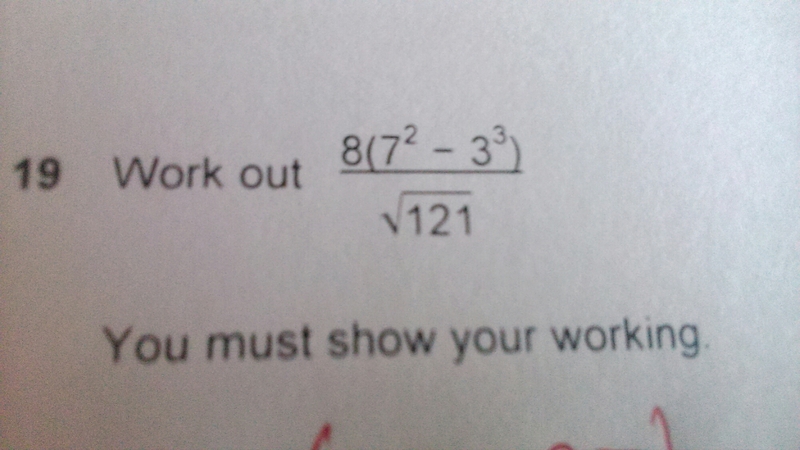 To me, all three answers are obvious, but clearly not to my year 10s who do understand isosceles triangles. The majority of my class put 70, 70 and 40. Which shows they have understood what an isosceles is, even if they haven’t fully understood the question. They have clearly mentally constructed an isoceles triangle with 70 as one of the base angles and written all three angles out. 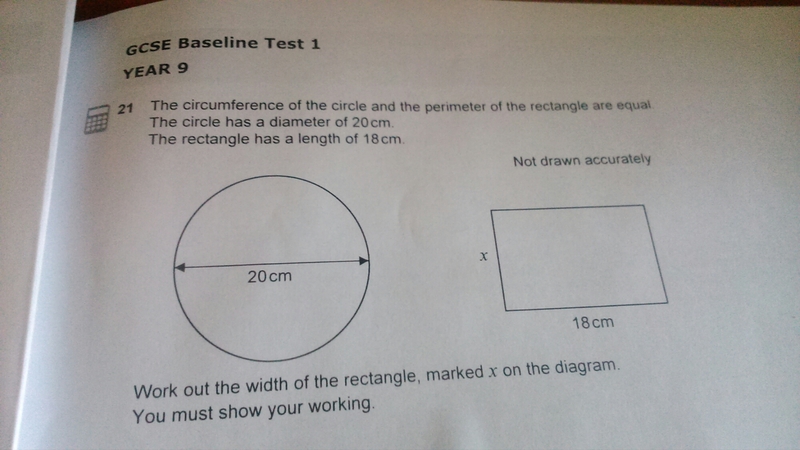 What they seem to have missed was that 70 could also be the single angle, which would, of course, lead to 55 being the other possible answer for B. 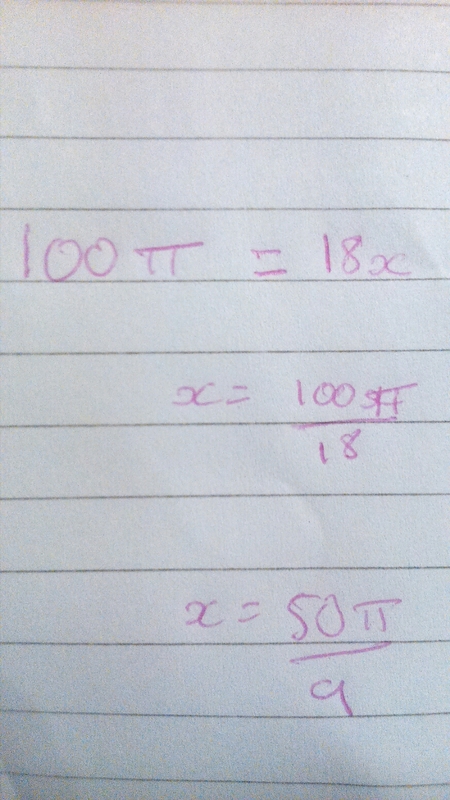 One student did write 55 55 70, so showed a similar thought process to most but assumed a different position for the 70. 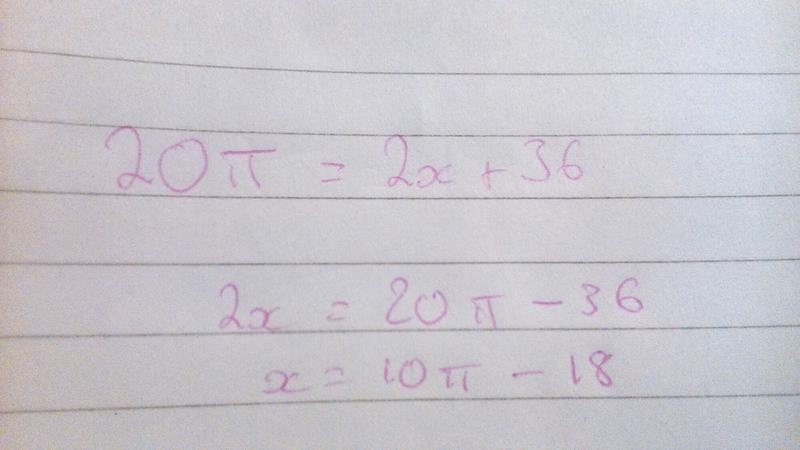 Now students are asked to explain why there can only be one other angle when A = 120. Thus they need to understand that this must be the biggest angle as you can’t have 2 angles both equal to 120 in a triangle (as 240 > 180), thus the others must be equal as it’s an isoceles triangle. The whole question requires a higher level of thinking and understanding than the questions we currently see at foundation level. In order to prepare our students for these new examinations, we need to be thinking about how we can increase their ability to think about problems like this. I think building in more thinking time to lessons, and more time for students to discuss their approaches and ideas when presented with questions like this. The new specification is going to require a deeper, relational, understanding rather than just a procedural surface understanding and we need to be building that from a young age. This is something I’ve already been trying to do, but it is now of paramount importance. There is a challenge too for the exam boards, they need to be able to keep on presenting questions that require the relational understanding and require candidates to think. If they just repeat this question but with different numbers than it becomes instead a question testing recall ability – testing who remembers how they were told to solve it, and thus we return to the status quo of came playing and teaching for instrumental understanding, rather than teaching mathematics. What do you think of these questions? Have you thought about the effects on your teaching that the new specification may have? Have you any tried and tested methods, or new ideas, as to how we can build this deeper understanding? I’d love to hear in the comments or social media if you do. More thoughts on the Sample assessment materials available here and here. So I’m working on some research, looking at motivation and effective teaching in A level maths. As part if my preliminary research has I’ve put together a short questionaire to help me shape the direction of that research. If you have completed a maths A level in the last 5 years I’d be eternally grateful if you could fill in this short survey. It shouldn’t take more than 4 minutes. I’d also be eternally grateful to anyone who knows anyone that has sat a level maths in the last 5 years if they’d share the survey with them. This post was originally published on Labour Teachers, available here, on 25th June 2015. My Geography teacher; the head of year 9; the head of year ten; the head of geography; two deputy heads; the head of maths and my form tutor. They’re the people I remember “having a conversation” with regarding my GCSE options, and more pertinently the fact I’d chosen wrong. The school I attended had a two year key stage 4, as was the norm then, so it was the end of year 9 that we needed to pick our options in. The choice itself wasn’t massively wide. We had to do maths, English, double science, RE, A language (mine was Spanish) – and obviously we had to do core PE, although this wasn’t examined. This left room for three choices, one was technology- I’m led to believe technology was a legal requirement. I chose IT and electronics (2 short courses and I was told this was because IT didn’t count as a technology). Then there were two option blocks. One had a limited number of subjects. History, Geography, IT and maybe a couple more. The other had these and all the other subjects one would expect. I chose history and music. The school encouraged all students (well the vast majority) to take either history or geography. Those deemed bright were supposed to take both. I was deemed bright. I felt under a but of pressure from a few directions, and if I hadn’t had supportive parents and a supportive music teacher I may have folded. I’m glad I didn’t. I enjoyed my music GCSE, I studied it beyond GCSE and I found it as academically demanding as the others. I also set a precedent, I was the first male for years to take music but that increased quickly. What’s this got to do with Ebacc? I’m not sure, I know when reading Nicky Morgan’s comments today I felt a little annoyed, having been in the situation described above. However, I do feel that the Ebac ensures that all learners have access to a good broad grounding. I’m glad I did music, but I’m equally glad I did the others as well. I worry that the focus shifting as it is will see subjects like music and art shoved a side and that would be a tragedy. I like the curriculum model Tom Sherrington (@headguruteacher) has shared recently, as it offers a good grounding which includes something creative. For too long we’ve got vocational education wrong. The rise of GCSE equivalent qualifications meant that learners could in fact walk away with a bagful of “GCSE equivalents” but arrive in the post school world to discover they are anything but. The Ebac and other recent changes have been positive in that respect, but they seem write off Vocational Education completely. Which is a shame as the idea is sound, we’ve just got it wrong for a long time. I think the Ebacc is nice in theory, but there are potentially worrying side affects for creative subjects. I also think that all the policy at the moment is patching up holes, instead of sorting out the structural damage. I like Tristram Hunt’s recent ideas regarding scrapping GCSEs and implementing a baccalaureate system that has two truly equivalent qualifications, one academic and one vocational, or technical. This is an idea that seems to be backed by John Cridland of CBI and could link in to changes on HE too, with technical degrees being introduced to increase the expertise in manufacturing. 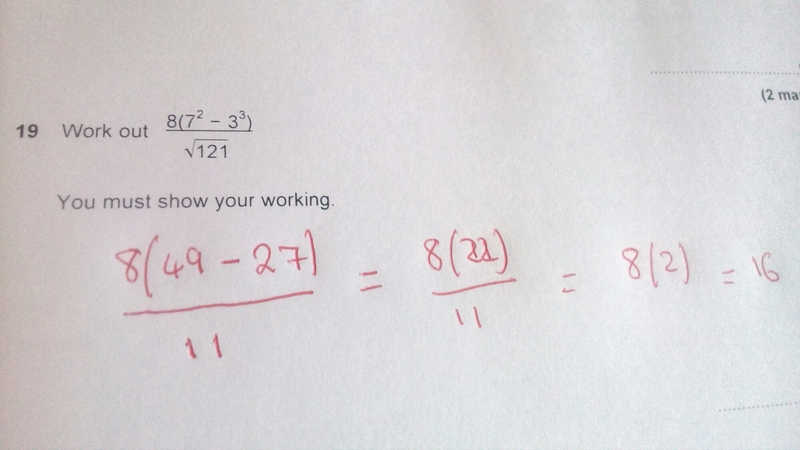 Today I was going through an M1 question with a year 13 student and was surprised to see the method he had used. The question involved finding an angle in a right angled triangle given the opposite and adjacent sides. The learner had used Pythagoras’s Theorem to find the hypotenuse then used the sine ratio to find the angle. This was extra interesting as earlier I had come across a markscheme which suggested the way to resolve a force at an angle of 30 degrees was to use Fsin30 for the vertical and Fsin60 for the horizontal! Further checking showed this learner did that too. What do you think? Have you got any quirky methods like this? Have any if your students? Do you have an idea why a markscheme would default to this position? I’d love to hear your response.